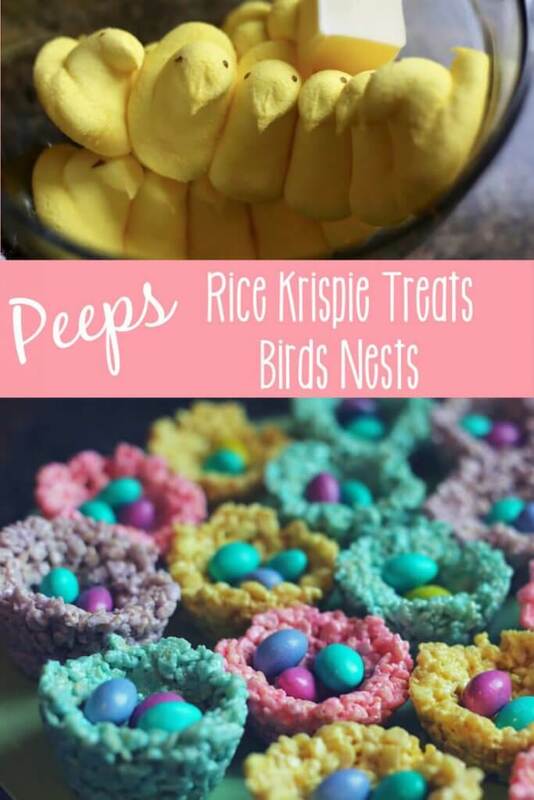 While we’re on the subject of quick and easy Easter treats, it really doesn’t get much more simple than these adorable Rice Krispie treat birds’ nests! 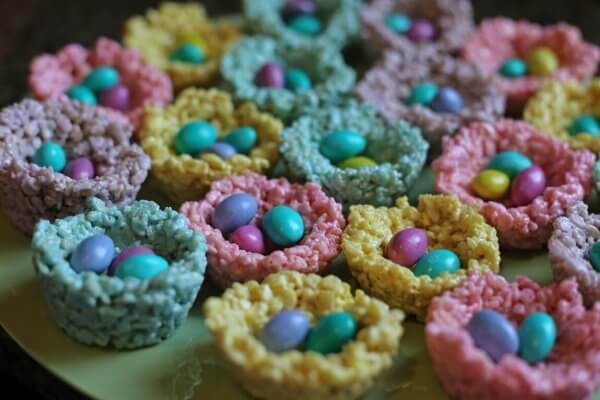 Last year, I fell in love with these perfectly spring Layered Peeps Crispy Treats from Yellow Bliss Road. I had previously planned on making these Easter Cookie Cups, but couldn’t get over how cute – and bright! 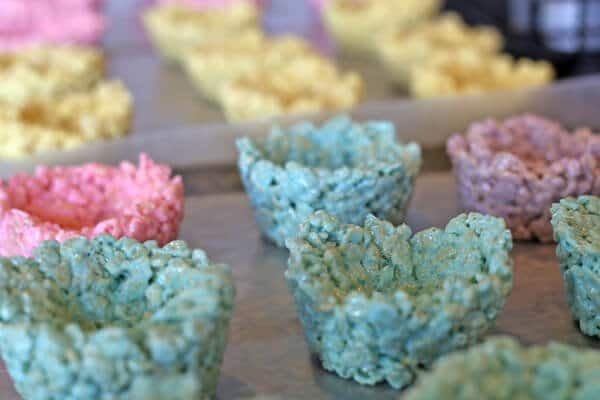 – the rice krispie treats were that Kristin had made using marshmallow Peeps. I decided to combine the two recipes into an equally simple, almost-as-cute Rice Krispie treat birds nest. Any of these options make absolutely wonderful treats for an Easter party or other event! They don’t even require any food coloring, despite their beautiful, bright shades. That’s entirely from using Peeps, which incidentally also melt even easier than the marshmallows they replace. 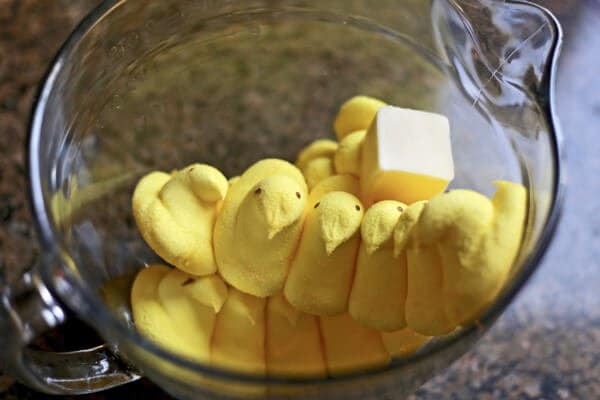 Melt one 3-ounce package of Peeps (all one color) with a tablespoon of butter or margarine. Stir until smooth. The colored sugar on the outside of the Peeps is all that you need to get these beautiful colors! Gently stir in 1.5 cups of cereal. 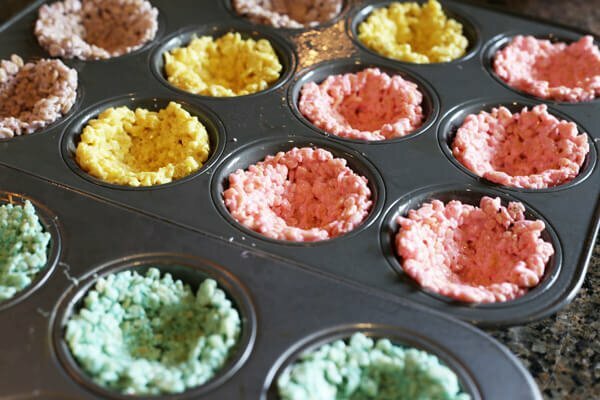 Press cereal into cupcake tins, to form a nest shape. I made approximately 5-6 of each color, but your mileage may vary. When the cups have cooled, gently remove them and allow to continue setting on wax or parchment paper. You may even take this time when they’re cool but still pretty pliable to shape them exactly as you want them. Repeat steps 1-4 with remaining three Peeps colors. Top with jelly beans, robins eggs, Cadbury mini eggs (the world’s best Easter candy, obviously…), etc. My daughter thinks it would be even cuter to top the eggs with a Peep of the still-intact variety. I think she should’ve suggested that last year, when I was making these and taking pictures. On that note though, the sky’s the limit. Turn the treats into Easter baskets with green-tinted coconut “grass”. 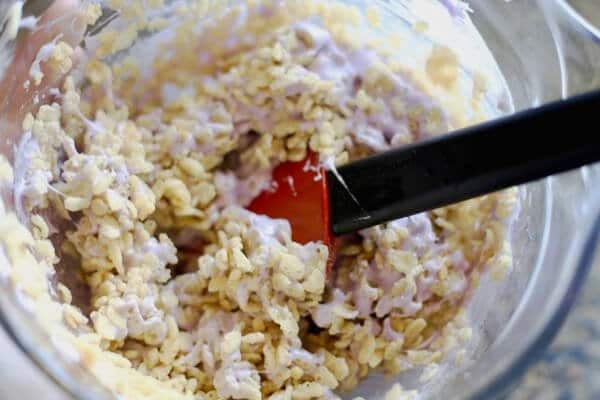 Use plastic Easter eggs as a mold for Peeps Rice Krispie Treat eggs. Use cookie cutters to make flowers or other spring-themed shapes. Super simple, super cute. Desserts and potluck treats that look like they take much more time than they really do are my favorite kind! 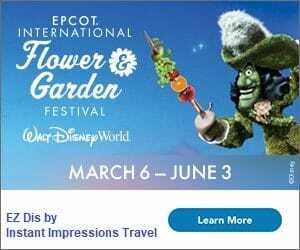 Previous Post: « What’s new at the 2017 Epcot Flower & Garden Festival’s outdoor kitchens?